Graduating students will be exhibiting their senior projects in painting, sculpture, video, installation, performance and other related media. Showcasing the depth and breadth of our students’ 2017 thesis projects. This exhibition is sponsored by the School of Art, Media, and Technology and is part of Parsons Festival 2017. 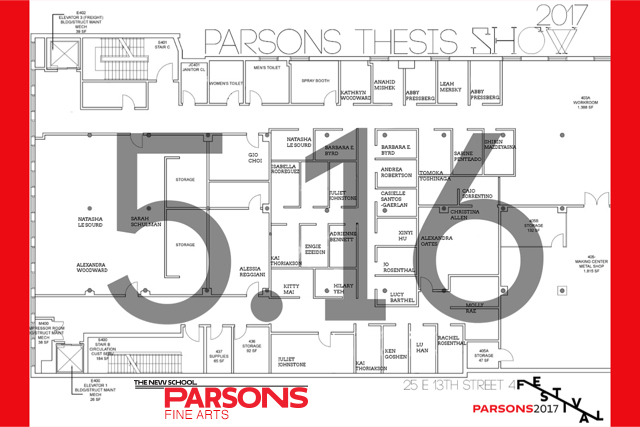 Parsons Festival is an annual series of art and design events in which cutting-edge student work is presented to the Parsons community and the public. The festival takes place at the end of each academic year and includes thesis exhibitions and critiques, thought-provoking public programs, interactive installations, gallery openings, workshops, and special events.